Apple’s stock price is at an attractive entry point for investors as the demand for new iPhones is leading to stronger revenue. RBC says revenues from the launch of potential iTV and other product lines, rising Apple Watch and AirPods attach rates, expansion of services business and continued buybacks will benefit the tech giant. Apple’s stock price is at an attractive entry point for investors because the demand for the new generation of iPhones will lead to a stronger bottom line, according to RBC Capital Markets. Intentions to purchase an iPhone increased to 26% – versus 20% last year – based on a survey of more than 5,000 individuals, according to a recent note from RBC Capital Markets analyst Amit Daryanani. Sixty-eight per cent of the respondents said they planned to purchase higher-cost, higher-tier memory models, according to the survey. The firm says the tech giant could also benefit from the launch of potential iTV and other product lines, rising Apple Watch and AirPods attach rates, expansion of services business, and continued buybacks. “We believe the fundamental reality remains that AAPL’s valuation is materially sub-par to what we anticipate is its long-term revenue and EPS potential,” Daryanani said. 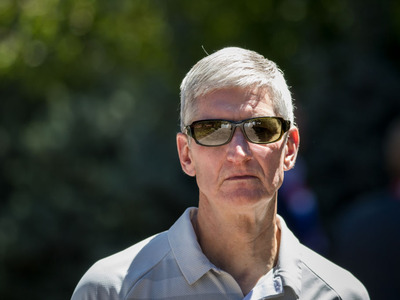 In May, Apple announced that it would buy back $US100 billion of stock. The company did not provide a timeline for the repurchases. But in the June quarter alone, Apple repurchased 112.8 million shares of its common stock at a cost of $US20 billion, according to company’s 10-Q filing. Apple, classically a hardware and devices company, is in the midst of what Wall Street calls a shift to services. Analysts are now expecting the services business to increase from 8% of the total in FY12 to an estimated 20% of the total in FY21E. The services business includes App Store, Apple Music and Apple Pay. RBC reiterated its “outperform” rating and $US250 price target – a 10% upside to where shares settled on Friday after hedge fund billionaire David Einhorn said he sold the stock amid concerns of an escalating trade war between the US and China. 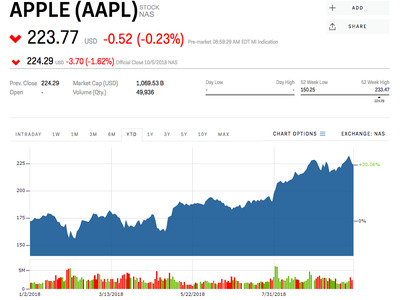 Apple shares were up 30% this year.